ISB’s Middle School serves children ages 11 to 16 under the interdisciplinary framework of the IB Middle Years Programme (MYP). About 100 students in grades M6-M10. There are currently two classes each in M6 and M7 and one class each in M8, M9 and M10. 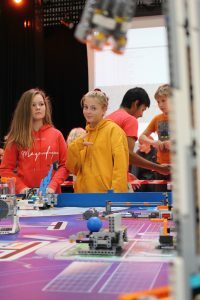 The MYP comprises eight subject groups, each taught with an underlying focus on helping students make practical connections to their own world and life experiences. The school day for Middle School generally runs from 8:00-15:45 (please see complete schedules below). The Middle School is light and airy with a large and flexible common area surrounded by subject-specific classrooms. During breaks, students spend time on a basketball court and parkour-inspired playground just outside the door. We are currently in the process of adding a wing to our Middle School, which will be ready for use in August 2019. In the eyes of the Danish school authorities, ISB is an “exam free” school, as students do not sit for the Folkeskole Afgangsprøve (the official public school exams). The same is true for many other private and independent schools in Denmark that follow an international or alternative curriculum. Students at ISB sit for official IB MYP exams that grant direct access to the IB Diploma Programme (DP) – for instance at the nearby Kolding Gymnasium, one of the other 15 Danish high schools offering the DP, or at an IB school abroad. Students also have access to the Danish upper secondary school system. There are several ways to qualify, and the Danish educational authorities direct the conditions for this procedure. For more information about the options available to ISB graduates, please see Life after ISB.